Have you ever visited Paris and seen the Eiffel Tower? It's certainly an impressive structure from every angle, but my favorite view of it is... from below. 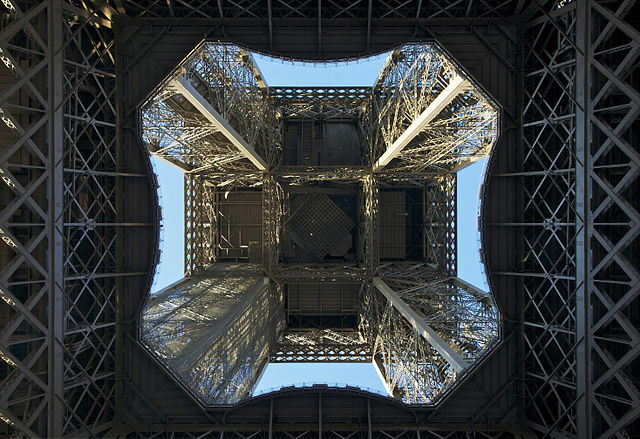 You can walk through the arches between the four massive feet of the tower, stop right in the center of the square base, and look up to an intricate forest of metal where straight lines meet curves in a geometric fest of wrought iron rods, beams and rivets. Above your head, 7,300 tons of metal reaching over 1,000 feet into the sky. 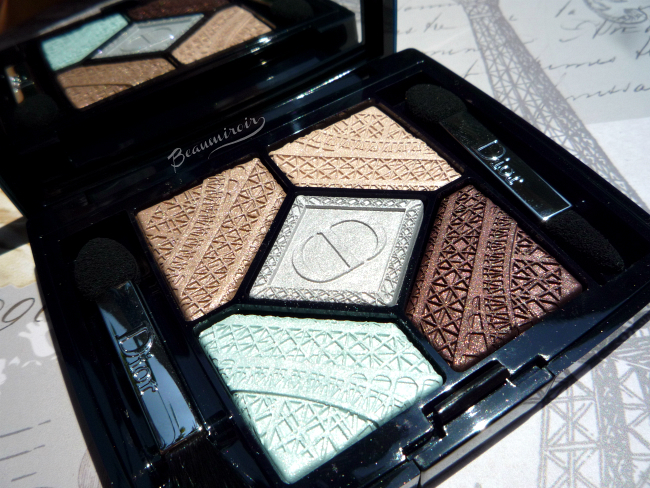 The spectacular metal lattice of this symbol of Paris is what inspired the delicate pattern embossed on the eyeshadows in Dior's new palettes, released with their Fall 2016 makeup collection called Skyline. Two new 5 Couleurs palettes just launched: Capital of Light, a cool harmony of pink, purple and grays, and Parisian Sky, the one I picked, a combination of warm neutrals, silver and icy mint blue. 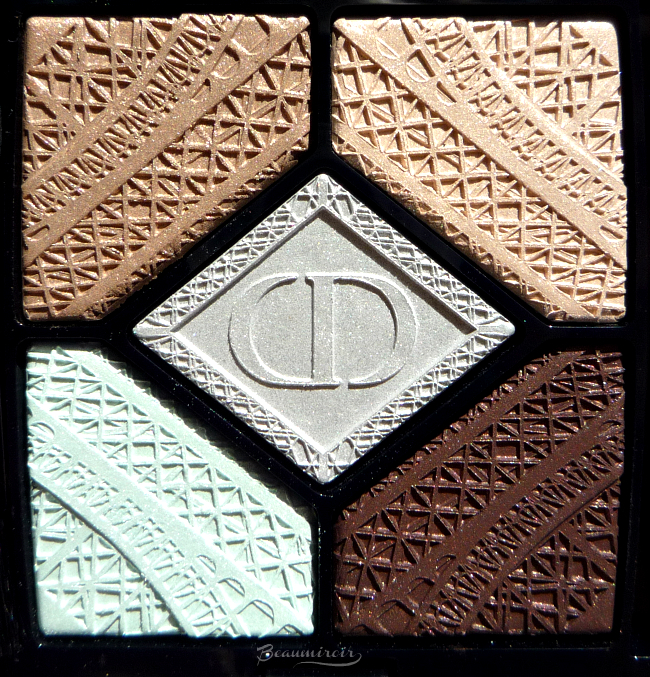 Dior's eyeshadow quints can be hit-and-miss, with more misses than I'd like in recent years, so I was at the same time very excited to try this beautiful palette and a little anxious about the quality of the formula. So was it a success or a disappointment? Let's find out! 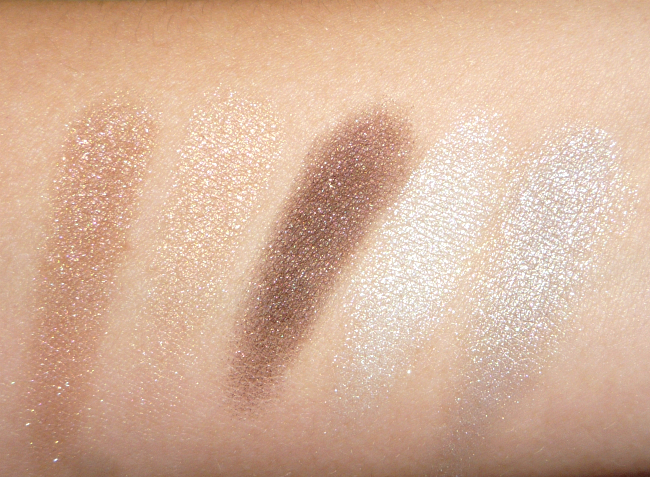 I was immediately relieved when I first swatched the eyeshadows: they're very soft and silky. The deep brown at the bottom right is a tad bit dryer, while all the others are buttery smooth. The pigmentation is also very good, with rich shimmery colors that twinkle in the light. Again, the brown is a bit different and looks a little sheerer when swatched, but it works very well on the eye, with just enough intensity to build nicely without being too much in one swipe. We're talking about Dior here, not Urban Decay, so the colors are on the muted side with medium saturation for an elegant, subtle result. The color combination is interesting, although I'm scratching my head wondering what to do with the silver. Parisian Sky contains, clockwise starting at the upper left corner: a medium nutty beige with pink undertone, my favorite shade in the palette; a light champagne; a warm deep brown; a pale minty blue; a silver gray. Obviously the three neutrals, beige, champagne and brown, work very well together, and blue mixed with browns is one of my favorite color combinations. But the silver? I'm not sure what it brings to this palette. Including a medium or dark blue instead would have allowed a much more interesting variety of looks. As for the minty shade, unfortunately it's a bit of a let down. While it's soft and semi-opaque, it basically looks like a frosty white on the skin. I can't detect any blue or green tint at all when I wear it on my eyes. It still works well as a highlighting shade, but I wish it was more colorful! All the shades are very shimmery, but the fine pearl does not emphasize the skin texture on my dry lids at all. Making one the shades a matte, preferably the dark brown, would have rendered this palette more versatile. However the soft pearl finish is very beautiful and luminous on the eyes. There are no large sparkles here. 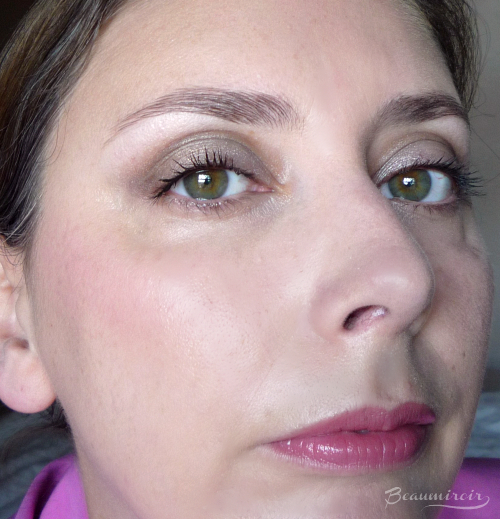 I always wear lid primer under all of my eyeshadows, so I'm reviewing the ease of application and lasting power of this palette used on top of a base. 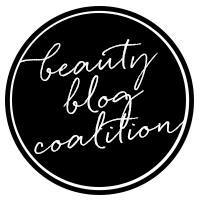 If you're not using eyeshadow primer yet, you really should. They come at all price points and they make everything more intense and longer lasting. I don't even see the point of testing eyeshadows without a primer! For reference, the one I currently use is theBalm Put A Lid On It. 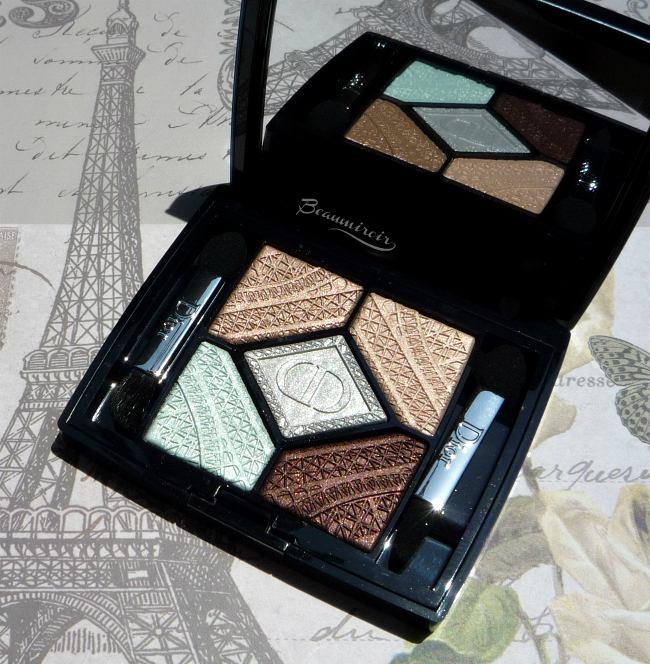 I found the eyeshadows in Parisian Sky very easy to apply, buildable for extra intensity, and they blend really well. They're just so soft that they sit on the lid beautifully without effort. They may be silky soft but they're not too powdery, so I didn't experience any fallout when using them. None. At. All. 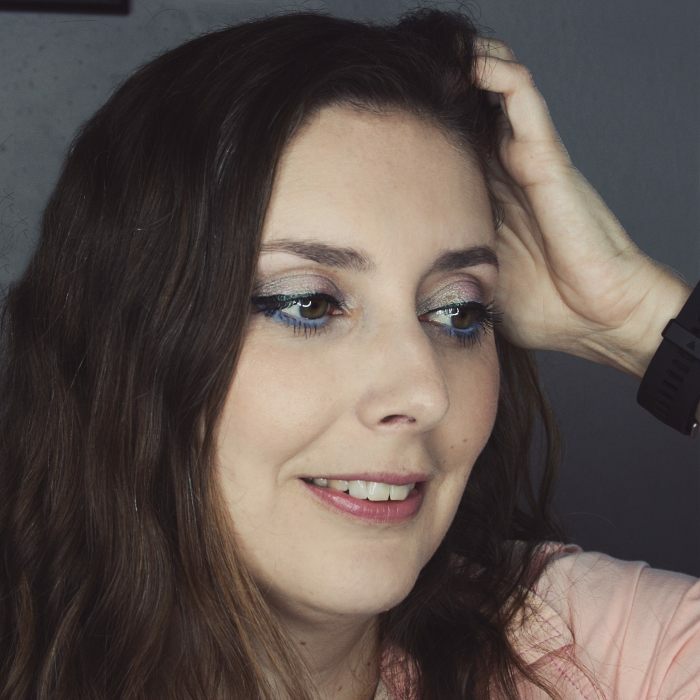 Every time I tried them, they lasted all day without fading or creasing, so my eye makeup looked as fresh at the end of the workday as it did just after I finished applying it. I created several looks with Parisian Sky, and they all turned out really pretty, elegant and flattering. I made a classic neutral look with the medium beige on the lid, the dark brown in the outer corner and crease, and the light champagne in the inner corner and on the brow bone. 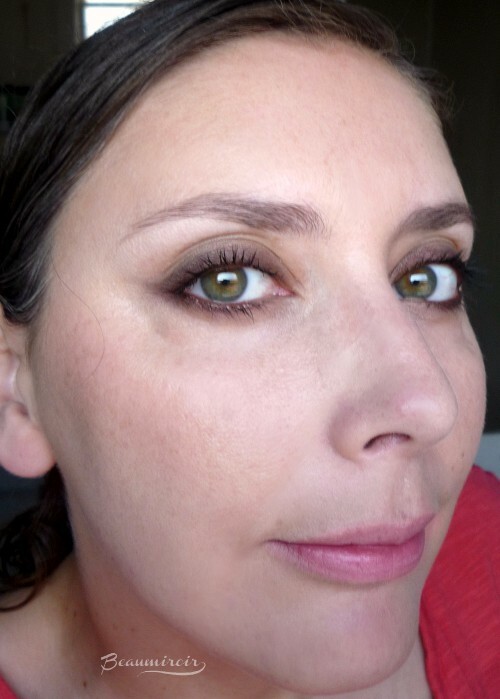 I also created a traditional smoky eye with the deep brown around the lash line, the medium beige on the lid and the champagne on the brow bone, you can see this look below. And I forced myself to use the silver, applying it to the inner half of the lid with the medium beige on the outer half, and brown on the outer V (see second photo below). I used the minty blue on the tear duct to add luminosity with most of the looks I tried. 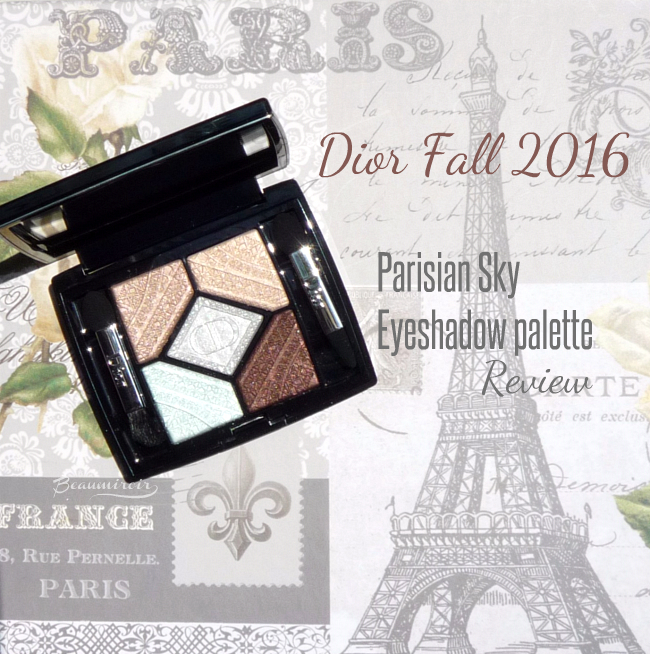 This is one of the best Dior palettes I've tried in a while. The shadows are silky and nicely pigmented, they blend well without fallout and last all day on a primer. 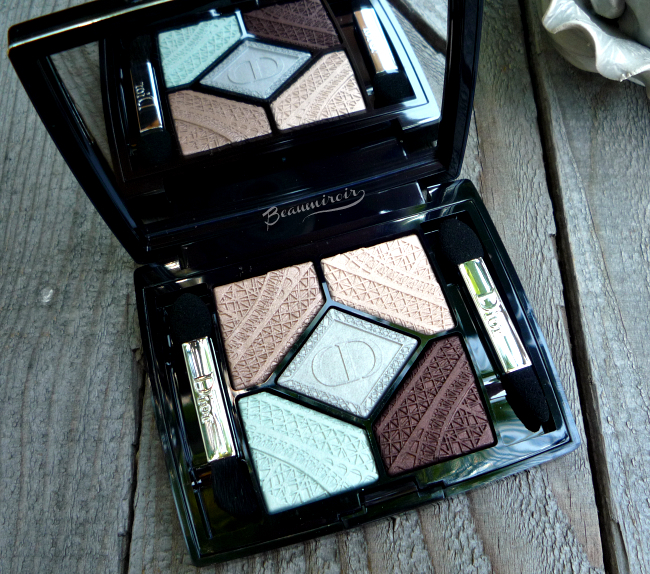 The shimmery finish is luminous and so flattering. I really like it, I just wish the minty blue looked more true-to-pan on the eyes. 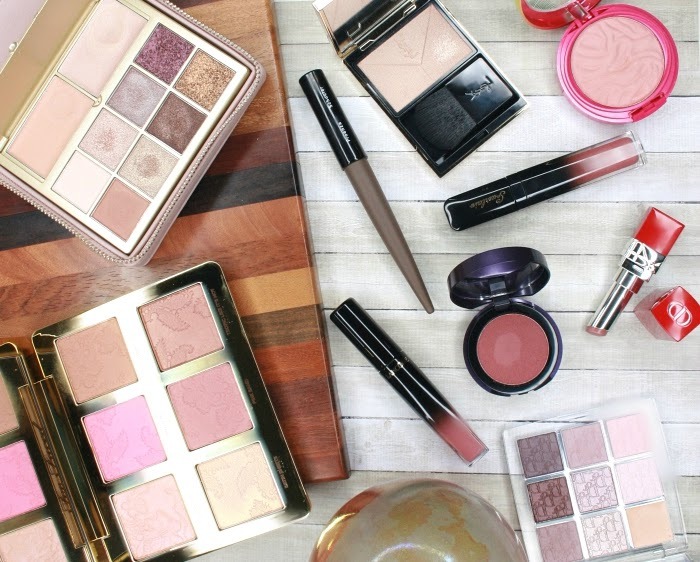 If you want to add a high-end neutral palette to your collection, this is a very good option!